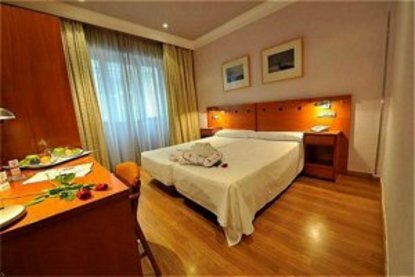 High Tech Cliper Gran Via Hotel is placed in the city centre, just on the corner of Gran Via St, an area full of life and activities, from which it*s possible to accede without the need of transport to the most important cultural monuments. We are situated a few minutes from *Puerta del Sol*, *Mayor Square*, and Royal Palace 5 minutes from Prado*s Museum and train Station Ave. The hotel has been completely renovated in 2002. We offer an excellent buffet breakfast, snack bar and business center with free high speed internet access in flat screen monitors. Parking available nearby with excellent discounted rates for our clients. All rooms are fully equipped with minibar, satellite TV, Free Canal plus, hydro massage shower, hairdryer, free safe deposit box, and individual air-conditioning or heating. We are specialized in duplex, family rooms and executive rooms provides of static bikes, ironing boards, king-queen size rooms and free high speed internet access. The hotel is provided with shuttle from hotel/airport and airport/hotel. Services is at a charge. Daily services from 0800 a.m. to 1900 p.m., *shuttle every 2 hours* on request. All this services will do comfortable your stay.